There isn’t a person in New Zealand whose heart beats, who has a functioning brain, who understands the value of empathy and support in hard times who wouldn’t agree that the citizens of Christchurch have endured and will continue to face the most difficult situation experienced by New Zealand citizens in the modern history of New Zealand. Harder than the Great Depression? Harder than the influenza epidemic in 1918? The Erebus disaster? The sinking of the Wahine? The Napier earthquake? The earthquakes and the ongoing aftermath in Christchurch seem somehow to eclipse all of this. That might be because time dulls pain and moves on and us with it. It might be because the media have an “in your face” presence in it all that wasn’t present in a less technological age. But the re-organisation of schooling in Christchurch is playing out in the media in a fashion that raises many questions about the nature of professionalism and leadership in such times. The use of school students, many very young, to man the barricades must have a huge question mark placed next to it. If the issue was the seashore, human rights, housing in New Zealand, the 1981 Tour we would have no difficulty in being hesitant in keeping the little ones out of it. And the scale of the issues is not reflected in the coverage. The issue is the future of a relatively small number of schools in a city which has been badly knocked around, schools and school sites damaged and a quite understandable decline in student numbers. Not only does this represent an urgent need to respond to this situation but also an opportunity to do so in a manner that moves the education system forward. And this at a rare time – there is money to achieve it. There would be little point in rebuilding the system exactly as it was in the manner that St Petersburg was restored after the 900 day siege during World War 2. Here is an opportunity to provide a group of children with new and better ways of working. Most principals in New Zealand can attest to the difficulty of getting capital works underway – there are simply no resources for it. And yet I speak with many teachers and principals who have great ideas for working differently, many not a lot different from those being proposed in Christchurch. The MOE Report Directions for Education Renewal in Christchurch makes good reading when read at a distance not with the overlays of emotion and self-interest that we would all bring to it had we personally been affected. Other areas are thankful that they have not had that catastrophic impetus for such a report but might also be wondering if such a “renewal” approach would be a good thing in their area. It therefore doesn’t surprise me that I am told that opposition to what is being proposed in Christchurch is balanced with a good deal of support. There are schools and principals and teachers who warm to the idea of working differently, in new structures and in facilities that simply do not replicate the old. But support is not what the media seeks – John Campbell rides to new levels in the ratings on the back of the negative stories from Christchurch schools and Novopay (helped also to a large extent by the laughable but not funny television programme that the other crowd have started in his time slot). The layers of emotion that the media have dished up in the discussions in the Christchurch education stories have also not been helpful. The community sees a lot of tears on television, what is needed in education stories is a bit more grunt about professional issues (consultation has possibly been one but you can’t rewind those films) and clear evidence about student achievement and learning. An inconsolable principal might be greatly sought out by the media but no argument is not advanced by it. The wearing of politicised apparel, the making of protest banners (some of which have simply been a lesson in rudeness and disrespect) and the access that the media has had to children all raise questions. The key professional issue that has been buried by the media in all this is that the kinds of changes proposed are ones that might profitably be spread throughout the entire education system. Where are the plans for the development of a new system that groups students in more effective ways, provides teachers with the spaces and tools that would enable them to teach to the high levels to which they are capable? A legacy for Christchurch might be that it led the way – education for the 21st Century might be to Christchurch what Art Deco is to Napier. One thing we can be certain of is that when the dust settles the media will have moved on to another story in another place with a different group of protesting people, teachers and students will still be there doing good work, unnoticed and looking back and wondering about it all. If you heard about an education conference called “The Character and Resilience Summit” would you be inclined to rush to register? The All-Party Parliamentary Group recently completed a report which it called “7 Truths about social mobility.” In a country so irretrievably characterised by social class and the divisions which it imposes on pretty well every aspect of social, educational, and political life, this is a bold move – not simply to tackle the issue but to have confidence that the process had discovered the “truths” of the matter. university is the top determinant of later opportunities therefore education achievement pre-18 is the key. Now all of these are either well-known or platitudinous – the All-Party Parliamentary Group on Social Mobility will not be known for having pushed back the frontiers of knowledge. personal resilience and emotional wellbeing are the missing link in the chain. Quite right they have claimed and immediately have called for schools to start teaching “resilience” and “character”. What do they mean? The old British stiff upper lip? The bash them on the bums? Cold showers? I have seen hundreds of students who will never know the advantages gained by others through social status and class who have demonstrated tons of resilience and have character in abundance that shows high moral quality and strength. It is largely a conclusion that can only, underneath the platitudinous gabble that they bring to the discussion, really believe that they have access to the perks of social class because they are better people. People with resilience and character. Producing a curriculum for character will be a challenge. But not so much for resilience. Schools already offer opportunities for developing both character and resilience through leadership opportunities, sports / music / cultural activities, school camps, education outside the classroom and so on. It is not resilience and character that will provide opportunities for social mobility for those who come from the lower status strata in our communities. No, it is the early development of those skills and attributes that happen significantly in the first three years of life – language (especially), peer and social skills, understanding of symbols and numbers, vision and hearing and emotional control. This has been “discovered” by many in this country and nicely brought together by Dr Peter Gluckman in his recent report. But is it really capturing both our attention and the resources? This has led to the summit on resilience and character being talked to by teachers from Eton. There is no doubt that the teaching at Eton is of a very high standard, I have visited the school and sat in many English classes where the teaching in the senior classes was certainly well into what one could expect at a university here. But it isn’t your normal group of students sitting in the room. They have all the attributes that you would expect of the social class they come from not only high competence in all the skill areas backed by a fierce commitment to study but also an unshakeable belief in their right to the privileges they enjoy and a total confidence that they will go on to be important people, and rich people. Yes, whatever you mean by it they have a resilience and the character they have is unmistakeable. If those who are disadvantaged in our current system cannot quite see themselves acquiring a country seat or two, finding parents who work in the colonies or in the government or in the city, and mixing with quite a different class they had better settle for something much more sensible. They will have to settle for learning language(s) well, getting basic skills in place and taking advantage of each and every opportunity that comes their way for expanding their experience and the set of leadership qualities that they have. Teachers will have to ensure that they are “high quality” in their trade. Most importantly, we need to do everything that we can to see that parents are supported to provide that critical environment for the development of those young brains. If suggestion and self-help don’t work then intervention might be the only way. St Valentine’s Day – a day of romance, love, the joy of hope, the euphoria of positivity. Just like yesterday when the Education and Science Select Committee started hearings on the Education Amendment Bill which among other things give the warrant for Charter Schools (now known as Partnership Schools Kura Houora). As could be predicted the submissions did not require even the hearings for their content to be known. Except for the Ombudsman who drew attention to what surely was a mistake in the drafting of the Bill – of course any sort of school should be subject to ombudsman scrutiny. Then I wondered – are independent schools subject to ombudsman inquiry? Must find out! Integrated schools? Surely! The ombudsman’s reported comments simply said that in the education cases she dealt with, it seemed mostly to be about stand-downs and expulsions that schools had “cocked up” and “cocked up big time”. This, I hope, was an exaggeration which flowed from the moment rather than a calm assessment of the workload. But calm assessment seemed from the reports to have been something a little light on the ground at this first day of hearings. I am amazed that education which ought to be identified with reason, with evidence and with scholarly discourse, prefers to present itself as something else. No survey study of charter schools anywhere has found that they are without exception, a “bad thing”. Generally the evidence is that there are good charter schools, middling charter schools and poor charter schools. It is clear that there are good state schools, middling state schools and poor state schools – we aspire of course to have good state schools. An interesting piece of the charter school evidence is that the proportions of good to middling to poor reflects closely the proportions of good to middling to poor schools in the respective state system. Would anyone set out to create a middling or a poor Partnership School Kura Houora? Of course not. Therefore blind opposition can only be ideological rather educational in origin. It surprised me that there was so little reported commentary on the general issue of school success and failure or of disengagement and truancy as key education issues that any new development must address. If a new development does not engage in activity that will deliver higher levels of success and lower levels of disengagement it would be probably not worth doing. This might have formed part of the submissions. If it was, then it has failed to make an impact on the media. In our peculiarly Anglo-Saxon education system (and in our peer systems of Australia, the UK, the US and parts of Canada) the key issues in education are the levels of success and failure in the education system, levels of disengagement from it and professional support for teachers working in it. It is therefore good to see that the Education Amendment Bill ties educational achievement to the responsibilities of the Board of Trustees. The key role of governance bodies such as Boards of schools is to provide returns to the shareholders and increase the value of the operation. In schools this is less about money but very significantly about the success that is brought into the homes of tax payers who support the schools through their investments of time and work. Issues of health, housing, youth justice, for instance, have their solution in education. Not that schools should attempt to directly address health issues directly other than by playing a proper educative role and perhaps working closely with health providers, nor should they attempt to address hunger which is a role of central government – Finland feeds everyone in schools, the US and UK means test eligibility for lunch while we struggle to put on a little breakfast in the odd place. Getting the focus clearly and back on achievement is perhaps the matter in this Education Amendment Bill that has the potential to make the biggest difference. As for Charter Schools – New Zealand, building on its long experience with charters for all schools, might be able to show others that with focus they can become another way of working. Of course working differently has never been very popular in New Zealand – that is a problem which often hides a solution. We need lots of educational red roses! “Coming Ready or Not!” was the cry whenever we were playing hide and seek or “tiggy” as it was known back then. And it has become something of a familiar cry at the start of each year as cohorts of about 35,000 all move up one class. Back then when tiggy was popular, the final line on a final school report for the year was “Class for next year ____. It was at that point that it was known to child and parents whether the student would proceed onward and upward or whether it was thought to be in their interests that they remain in the level they were in. This is because we have little idea of what constitutes readiness for the big transitions (home to ECE, ECE to primary, primary to secondary) let alone the transitions that take place within institutions at year’s end. In 1989 President Bush in the fervent excitement that no child would be left behind declared that “by the year 2000, all children in America will start school ready to learn.” The only problem was that there was no shared understanding of what that meant. But parents perhaps intuitively do have a sense of readiness for you often hear a parent say that their child is “ready for school”. I wonder sometimes if they mean that they are ready for him/her to go to school! What has to be understood is that transitions are a process and not an event and that the three parties to the process – the group from which the young person is farewelled, the group into which the young person is being received and the student/ caregivers from home – each have a vital role to play in this process. The Receivers need to help the other two groups understand what they mean by “being ready” while the Farewellers need to reflect on what that means for them in the provision of a programme that will achieve a substantial number of the skills, aspects of knowledge and dispositions that have been identified. This is no easy task, that is probably why it hasn’t been done. But it is arguably the most important way of helping everyone give meaning to their respective roles in the process called a transition. Excellent work is coming out of the United States in the area of College and Career readiness. David Conley has developed a useful overview of the process and what we learn from that work is that readiness is not a single dimensional factor but rather a collection of features that develop and mature at different rates. Some of these characteristics spike early while others take more time – and the good news is that it varies from student to student. National Standards perhaps had the potential to be helpful in leading people to an understanding of at least curriculum levels that are appropriate but all that got lost in the noise. But a readiness statement will encompass more than just academic preparation standards, although they are important. And agreeing on them is no easy task. When they set out to do this in the US for the start of schooling there were some clear differences between parents and teachers. physically healthy, rested and well-nourished. It is not at all clear just what readiness statements could helpfully look like. But unless we start working on them we shall never know! Before I went to school this was how many a morning started when my mother had the radio on and listened to Aunt Daisy while completing all those chores that mothers have when they have pre-schoolers. Aunt Daisy was a broadcasting phenomenon in the 1950s and in that era before the cult of celebrity took grip on New Zealand, she was a widely known and greatly loved figure. Not only did she broadcast her daily programme, she wrote a cookbook or two, a book of “Handy Hints” which I have and which is encyclopaedic in its scope. Above all she was a character. Then there were others, Selwyn Toogood comes to mind. An effective broadcaster across radio (quiz shows, hit parades, general programmes and so on), he made the transition to television with both quiz shows and “handy hint” panel shows. There were many others including Colin Scrimgeour (before my time!) who were greatly famous for their role – in his case in having the government jam his radio station when he was thought likely to be about to urge listeners to vote for the Labour Party. None of these kinds of broadcasters can be summed up in terms of comparisons to broadcasters of today. The way they worked, the technology they had (or didn’t have! ), the stiff formality of all media in those days, the respect for people’s privacy and dignity, the concern for high standards of language use – all these factors circumscribed the way they worked on the media and the kinds of people they were. All this has come to mind as the media over the past several months has tracked the tragic decline from good health through to the too early death of Sir Paul Holmes. When the media become concerned about one of their own they know no limits and one simply excuses the excesses as emotion over-rules normal practice. He has been described as New Zealand’s greatest broadcaster of all time and I wonder about this. He certainly was a remarkable character with as much confidence as he had talent across a wide range of things. But the claims are a little over the top. Like all people who enjoy success, they do so on the shoulders of those who went before. He came to talkback radio and was able to mould the “breakfast session” traditions, well established by people like Phil Shone and Merv Smith with the still relatively new talk back radio potential pioneered by the likes of Gordon Dryden, Eccles Smith, Geoff Sinclair and Tim Bickerstaff and Sir Bruce Slane. I think that the last one there, Sir Bruce Slane, a well regarded legal figure actually used a pseudonym since some practices of the past still prevailed and it was not totally acceptable for a lawyer to be doing this. Then there is the issue of current affairs. Sir Paul Holmes was not only the brightest star in the current affairs constellation over quite a period of time but, for the past ten or so years, pretty well the only one. Radio has been better in this regard than television. A serious discussion with him at the helm was a serious discussion. Well informed, well prepared, quick on his feet and faster with his tongue, he stood alongside those he interviewed and it was often good television or radio. 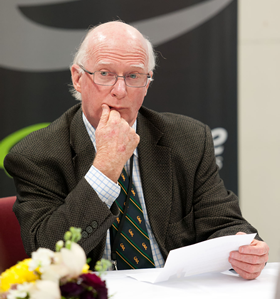 But the last twenty years of current affairs barely bears comparison with the previous twenty years when a stable of commentators seemed to make television the go-to place for intelligent discussion of what was happening in New Zealand. Of course the success of Muldoon and Lange and their governments handed them plenty to get stuck in to and they did this with energy and at the time a ferocity that was there with Paul Holmes but with no-one else. A mark of greatness is perhaps the ways in which a gap is filled when such people move on. There has been no explorer / adventurer / philanthropist to replace Sir Edmund Hillary and there might never be one of his ilk again. The wisdom of a Sir Paul Reeves is badly missed in these fractious times. There aren’t many to step up to fill the gap left by Sir Paul Callaghan, a rare talent. To be sure, Sir Paul Holmes left large gaps when he moved on. Mark Sainsbury never captured the magic that sustained the eponymous Holmes Show, Mike Hoskings suffers by comparison in the breakfast slot while Jack Tame is a very poor out-of-depth substitute on Saturday morning radio. And Seven Sharp just beggars belief – not current affairs, not adult, not intelligent, low level humour…. Children’s’ television? No, it can’t be, children demand more intelligence and better humour. Holmes was one who took the cliché out of being “a hard act to follow’. We have people who do well, athletes, rugby players, musicians (some of who would be considered “great”) and lots more but our sense of proportion in our judgments is often distorted by the media that wallows in its power to create greatness. Does not the extent to which the weekly magazines immerse themselves so deeply in the trivial and with people who are famous simply because we are told they are famous, somewhat astonish? Greatness is not a crowed place and the media might reflect a little more on who might already have got there before they dish out the accolades. Reflecting on the past, not just the last few minutes relatively speaking, is not a bad thing. Perhaps perspective requires this. Do we get this right in education? Could we name our great teachers and educators? The ones who really made a difference? It would be worth giving this some thought at this time when the media is obsessed largely with the negative when it comes to education. The agenda will be set by them if we do not set a different one.